The date palm is an ancient and productive symbol, an icon whose feathery fronds fringe desert oases. In terms of the speed of return for your outlay, dates plod to maturity. 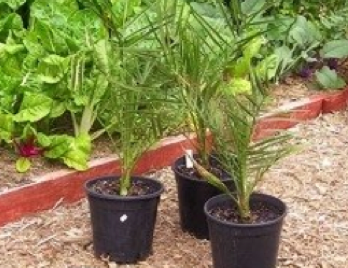 But once they’re fully matured at around fifteen years old, a date palm, Phoenix dactylifera, will crop handsomely. Palm sugar, palm wine and its delectable, nutritious fruit are loved by people of diverse faiths as well as the faith-free. They’re most commonly eaten after having been preserved in sugar. Sulphur is sometimes added to help preserve dates, and limited amounts of sulphur may be found in certified organic fruit. As far as fruit go, preserved dates have a pretty small environmental footprint, neither production nor transport need be resource intensive, and most people rely on old, established plantations in the Middle East and north Africa. Outside the Middle East, Africa and South Asia, very few people have actually eaten a fresh date, which is an entirely different flavour from the sugar sweet fruit most of us know. Dates fruit best where there’s a long, warm, dry summer following winter rain, so places in mainland Australia like SA, southern WA and inland Australia have the best natural growing conditions. There’s 14 species of date in the genus Phoenix. Many gardeners will be familiar with the dwarf date, P. roebelinii, a tough landscape plant. The Canary Island Date Palm, P. canariensis, with its massive trunk, can be grown anywhere in Australia – even in Hobart – but not in a cool temperate climates. Its tiny fruit, about the size of a small pea, are edible. They’re a reliable famine food. The mangrove date palm, P. paludosa, is the most tolerant of humidity, waterlogging and salinity. It’s grown in South Asia. The sap of P. sylvestris and P. paludosa their trunks and in their flower stalks is tapped. Sap is dried to make palm sugar, alternatively the sap can be fermented to make a potent wine or spirit. Certain Phoenix species are also felled so their pithy stem centres can be cooked and eaten. Date palms cope with salty sea breezes, and plants cope with some salinity in their irrigation water, as long as drainage is perfect. They make great ornamentals in the wet tropics and coastal subtropics, but fruit is often ruined by fungi in summer. Dates survive drought well, but since they’re slow growing, some extra water during dry weather between autumn and spring is useful. Climate change around eastern Australia means land away from the humid sub-coastal regions towards the Dividing Range is increasingly suitable for growing dates. Their potential as an Australian crop has never been fully exploited because they are slow return investments – a date plantation is slower to mature than a timber plantation. In the Middle East dates have been cultivated for thousands of years in the same locations – rather like olives they are a sustainable, long-lived crop. Most pests and diseases can be readily managed. Two soil-borne fungal diseases – Fusarium and Phytophthora – are of concern and to manage these horticultural hygiene and drainage are essential. I grow and plant the date cultivar ‘Medjool’ because it’s the only one commercially available to ordinary gardeners. These are mostly grown in the USA for export. I acquire the seed from shop bought fruit preserved in sugar. I get about 25% germination. See http://www.medjooldates.com for some general information on this cultivar. A date palm seed, found by the Dead Sea, and carbon dated at 2,000 years old, was still alive and was germinated. It takes about five years for them to start fruiting, and by the time they’re fifteen your kids will be old enough to pick their bounty. Production is steady and may continue beyond 100 years, so think of dates as an inter-generational gift. Dates are pretty sustaining, a single fruit contains 51g energy, and with 100g potassium per fruit dates are highly competitive source compared to bananas. Dates are fat free, but each fruit will contain good amounts of Vitamin C, a small amount of protein (0.5g), quite a lot of carbohydrate as sugars (14.5g), other carbohydrate (3.5g), 5g of sodium, and a hint of fibre (1.5g). Poorly treated Phoenix spine injury is one of the leading OH&S risks for gardeners and landscapers in Southern Africa, so handle all Phoenix fronds with care. They are armed with spines that may scratch or puncture skin. Wounds often become infected, and septicaemia is a risk, so wash then disinfect minor scrapes and injuries. If swelling or pain develops, promptly see a doctor.